We know summer is around the corner when the community comes together for the annual Twilight 5K Run/Walk through the streets of South Miami. Thousands show up for this great family-friendly event, started by the late John “Hans” Huseby and Laurie Huseby of Team Footworks. In just a few weeks, divers will be competing in the Spiny Lobster Tournament organized by restaurateur and angler Mike Maler of Deli Lane/Sunset Tavern. SOMI Magazine kicks off summer entertaining with a visit to six area restaurants to discover the perfect SOMI Summertime Cocktail. Get the ice and shaker ready and get inspired with our featured summer cocktails. 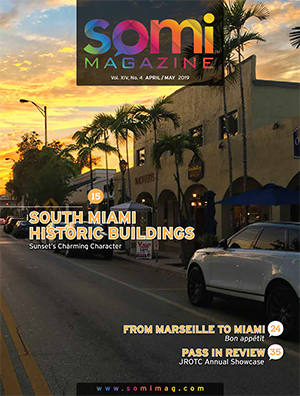 SOMI Magazine is committed to bring our readership information about our greater Miami community cultural resources. We’ve heard from many who appreciate the coverage the magazine has given, most recently on occasion of the tenth anniversary of the Adrienne Arsht Performing Arts Center, and in prior issues covering Fairchild Tropical Garden, HistoryMIAMI, the Jorge Perez Art Museum, the Barnacle and John Pennecamp Park with our “SOMI Underwater” feature last year. The Underline continues to make news and dramatically expands its base of support. SOMI Magazine and I are pleased to support this initiative. In this issue, we have our regular Underline Update with notes by founder Meg Daly, and special coverage of the reception held high above ground at the new EAST, Miami hotel and announcement of big dollars going into the first phase of the project at the Brickell Station. As The Underline unfolds of the course of the upcoming years, the South Miami hub along The Underline is the only “hometown connection” on the ten mile trail/park and great connections to wellness at South Miami Hospital. (Check out somimag.com for our cover feature April/May 2015). In this issue we cover the new Level One Trauma Center at the Kendall Regional Medical Center serving our readership area. I hope you don’t have to take advantage of their services, but just in case you should know the new level of care in our community. Read about this new trauma center starting on page 35. As part of our regular Wellness article we visit a new restaurant concept nearby, GROWN, serving “real food, cooked slow for fast people.” They are a great addition to our SOMI community. SOMI Magazine welcomes new UM Football Coach Mark Richt, an alum and top collegiate coach. ChamberSOUTH was the first chamber to welcome the coach at its monthly breakfast. Meet up with Sebastian and the coach on page 30. 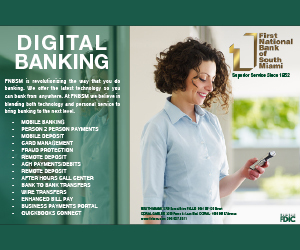 We welcome our new businesses coming online here in town that are featured in our popular “What’s New” feature on page 40. We appreciate their investment and commitment to our community. 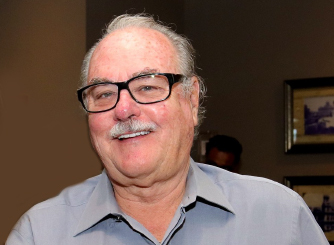 And speaking of investment into our community, as you may be aware, The Shops at Sunset Place was purchased several months ago from Simon Properties. The new ownership group includes a prominent and critical local development team. A visionary plan is being developed and discussed with community leaders. 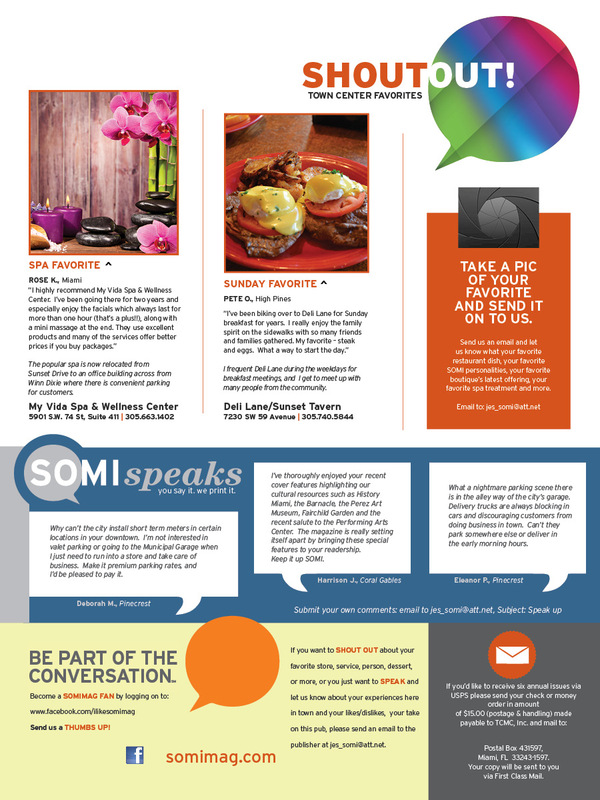 Expect that you’ll be reading and seeing more in upcoming issues of SOMI Magazine. I invite you to “Be Part of the Conversation” and weigh-in with your comments in our Readers Survey which is found on page 20 or you can complete online. Your comments are always welcome, especially as we look forward to our twelfth year publishing the magazine come this October. See you at the July 4th celebrations!